Here's what went down when Roger Federer met Rafael Nadal in the first men's semi-final of the Australian Open last night. Federer wins the first three games of the first set, including a break of Nadal's first service game, very easily. Most common Chris Fowler and Patrick McEnroe "analyis": "Wow." "Uh-huh." "Yup." 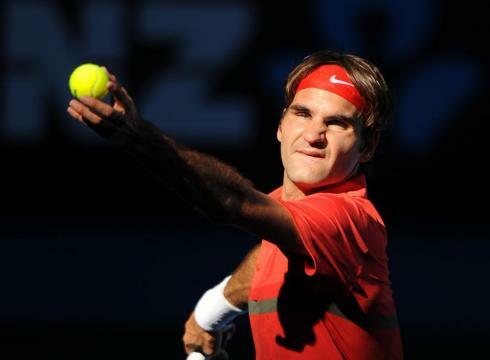 Federer plays, as has been said many times, an otherwordly style. He really looks as if he's not trying at all. Nadal, on the other hand, is a beast: a roiling ball of energy and explosion. In the sixth game of the first set (Federer up 4-1) a bullfrog starts croaking loudly during Nadal's serve. He wins the game anyway, to stay within one break. Only down under. Next, Paul Hogan will be showing up to tell us what a knife really looks like. The ESPN producers have apparently decided that the coolest thing in the world is the super slo-mo replay of the players hitting the ball. It's an interesting way to watch the angle of the racquet through the ball, but the looks on their faces...I'm expecting an alien to burst out of their stomachs every time. Nadal breaks back and is down 4-3 in the first, on serve. 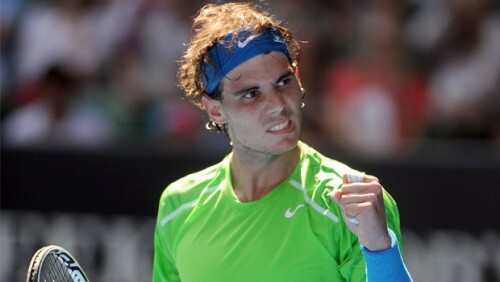 Fowler suggests that a close match favors Nadal, who comes out in the eighth game blasting. Federer looks tentative, seeming to have hung all his hopes on that first break. Rather than take balls early and decisively, he's thinking too much and having a lot of mis-hits. Nadal holds to go to 4-4 with Federer shanking all four shots. I'd like to be described, as Federer just was, as having "amazing" balance. "You know Nick...he's the tall guy with glasses and amazing balance." Four easy holds and we're into a first-set tiebreak. Tiebreaks stress me out. Winning a set in tennis is normally the result of so much hard work, and so many points won, that it feels crazy to let the win fall one way or the other based on a couple points. To go from being up 6-5 in games (and 2-0 in this tiebreak) to losing this first set seems like it would really break Federer. McEnroe agrees, saying that it's far more important for Federer to play from ahead. It's a misplaced fear, though, as Federer takes the first set tiebreak without breaking a sweat. Literally. Of course, that loses some of its oomph when you remember that Federer NEVER breaks a sweat. Federer breaks Nadal at love to go up 1-0. An impressive game. They show a stat that Federer has won 90% of his second serve points. Ridiculous. The technology that allows tennis replays is like magic to me. There's a machine that can track a tiny sphere traveling at upwards of 100 mph through three dimensional space to within millimeters? And it's trustworthy? Really? And still no teleportation? Nadal breaks back at love, by the way, 1-1. Neither player can solidify an advantage. Um...a long break in the action for a random 10-minute fireworks display. Paul Hogan, can't you control what's going on down there? Seriously, stop with the super-slo-mo replay after EVERY point. We just had to suffer through Nadal jumping and fist-pumping in super-slo-mo. Want to know how to make one of the world's finest athletes look awkward? Show him fist-pumping at 5 frames a second. Nadal deserves his celebration, though, as he passes Federer with two phenomenal shots to break again for a 4-2 lead. Federer's down 0-30 in his service game while down 5-2 in the set. I always wonder at what point a player decides to sacrifice a set that he probably can't win in order to save some energy for future sets. Nadal doesn't seem to ever do it. Federer seems to be doing it right now, broken at love to lose the second set 6-2. Federer starts the set in a funk, and was about to go down another break to 0-2, but fought back though multiple deuces to fight back to 1-1. After that, he's back on track, (a track which Nadal never left) and we're on serve for 4 games, before Federer almost miraculously breaks to go up 4-3. Nadal seems to be playing with more energy and resolve, and it's only Federer's pure skill is keeping him in the match. Though he leads, it feels as though he's hanging on by a thread. The viewer gets the clear feeling, as Federer double-faults, that Nadal will break back and go on to win the set. And so it goes. Nadal breaks back, and does it pretty easily. 4-4. A couple more holds each way, and we're back to a tie-break. If Federer loses this breaker, it's hard to imagine him winning this match. They just showed a fan holding the Australian Open official program, and I notice that Nadal (#2 in the world) is front and center, with a bigger face than anyone else. Novak Djokovic (#1) is shunted off to the periphery. I'd be annoyed. Nadal is crushing this tie-break, and the fans seem to sense blood in the water. They were cheering pretty overwhelmingly for Federer early in the match, but seem to be rooting for Rafa now. Maybe that's served as motivation for Federer, though, who has clawed back from 2-6 in the tie-break to 5-6. All it takes is one more from Rafa, though. And there it is. We're on serve in the fourth, but that's not going to be good enough for Federer, as he's not dominating his service games, which doesn't bode well for a potential third tie-break. It feels like he's got to break Nadal and win this set outright. It's 3-3. After a couple of holds, Nadal makes what must be the killstroke. He breaks Federer on ANOTHER ludicrous passing shot (he's hit a bunch of them, each with more bite, power, and closer to the line than the last) to go up 5-4. Federer will soldier on, but everyone knows this one's over. And it is, 6-4 in the fourth. 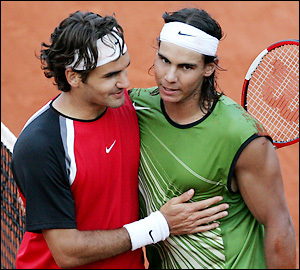 Nadal is jubilant; Federer, as ever betrays no emotion whatsoever. Federer wins by outplaying his opponents. That sounds obvious, but let me put it another way: Federer can ONLY win when he's playing better tennis than the man across the net. Nadal and Federer seemed evenly matched, in terms of skill, during this battle. Nadal fought. Nadal scrapped. Federer doesn't do that. It's beneath him. That's not to say that he's an elitist...he's just elite. When playing a match against an opponent as good or better than him, Federer will lose, as he did today. We'll see in a couple of days if Nadal can fight hard enough to beat Djokovic, whom he will almost surely meet in the final, and who, right now, is the better player. Nadal wins, three sets to one. G'night.